If you are only adding a few emails or phone numbers, you can enter them one at a time. Just enter the email address or phone number and name of your guest in the appropriate box and click Add. Use this option to copy and paste a list of multiple email addresses or phone numbers at once. The email addresses or phone numbers should be separated by commas, semicolons, or returns. Please note that if you add phone numbers in this way, the name for each contact will just be a copy of the phone number. Use the Import Contacts option to add contacts from your email account, a spreadsheet file, or from a group email address. You can only import phone numbers from a spreadsheet file. You cannot import phone numbers from your email address right now. 1. 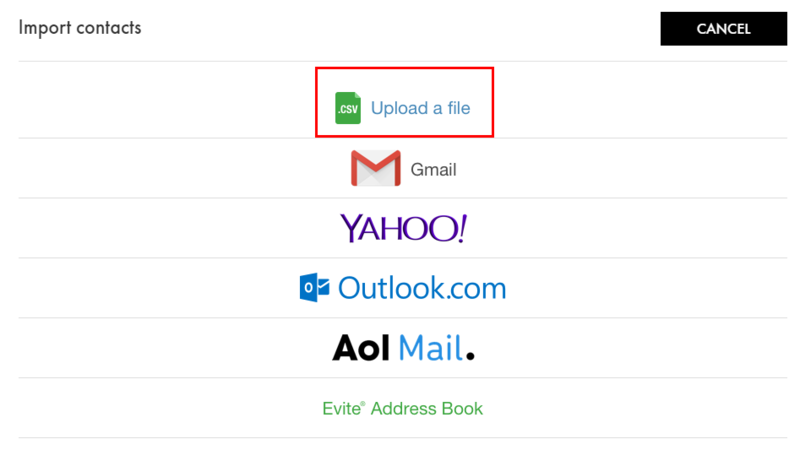 Upload a file: If you have a CSV spreadsheet file of your contacts you can upload this list to Party City. Click the Import contacts link and choose Upload a file. For additional help uploading your file, check out this article. 2. Import from webmail: Choose this option to import contacts from popular webmail providers. You can import from Gmail, Yahoo, AOL, and Hotmail. You can even import contacts from an Evite account. Have you used Party City digital invitations before? Any contact information that you previously added is stored in your Contacts. 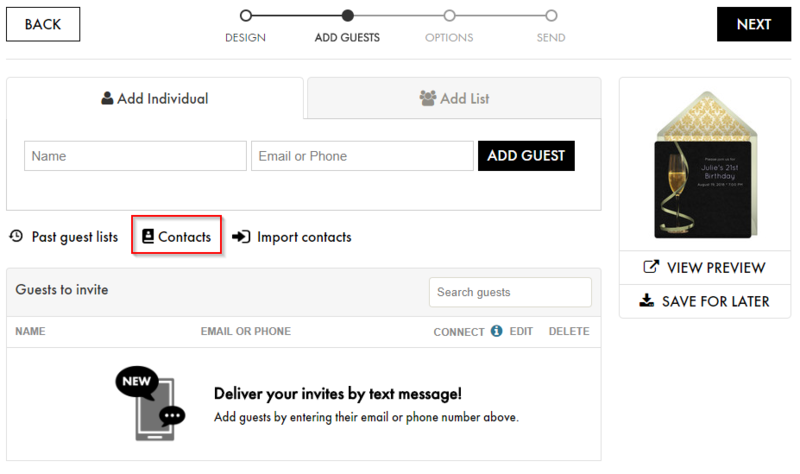 Choose Contacts and you'll be able to select any contacts from your past guest lists. 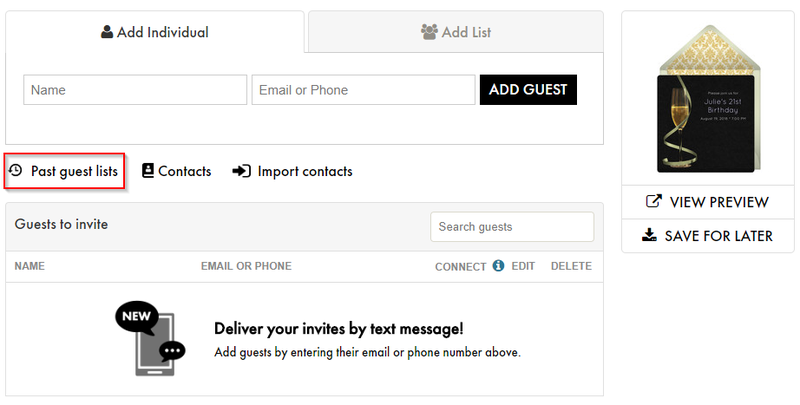 You can use the Past guest lists option to recall contacts from invitations and cards you've sent out previously. If you would like to build your guest list from our iOS or Android apps, it's very easy to import contacts directly from your phone. When you land on the Add Guests screen, you will be prompted to give Party City permission to access your phone contacts. Select Yes and follow the prompts on your phone.